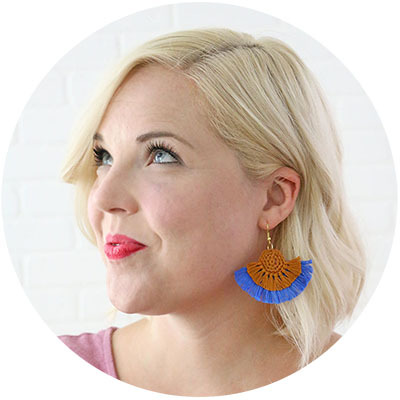 Make your own Tie-Front Crochet Headband Pattern for a simple project that’s cute with a funky edge. 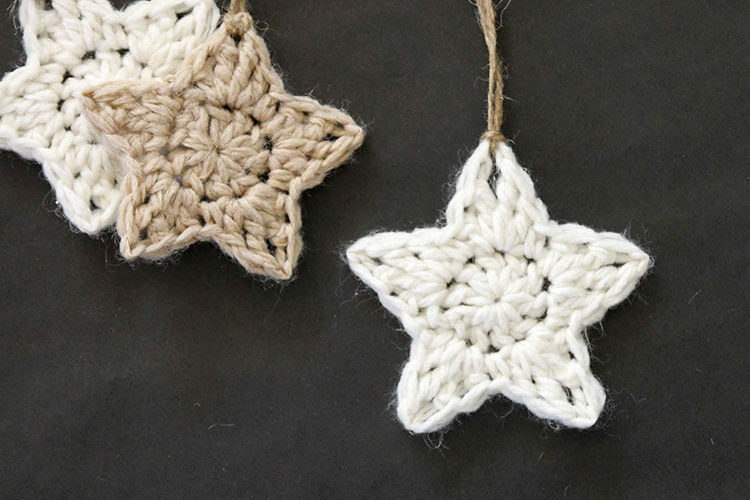 This free pattern works up quickly and makes a great gift. 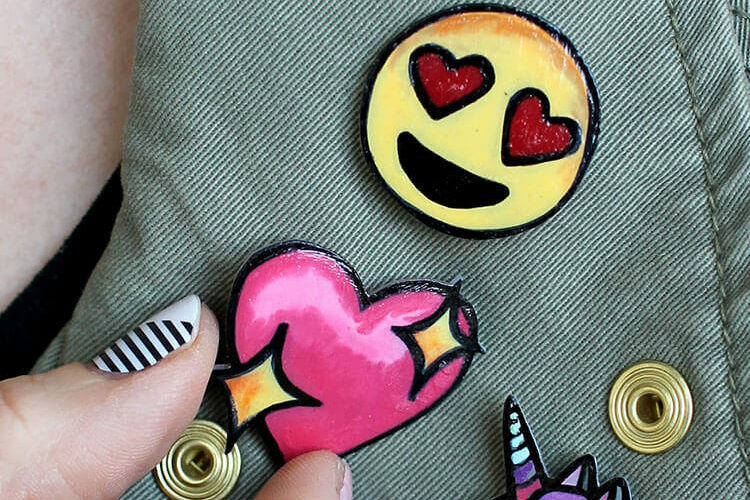 This post was originally shared by me at Crafts Unleashed, and contains affiliate links, which help to support this blog. Thanks! I made this little guy over the summer when it was still over 100 degrees here in Vegas. 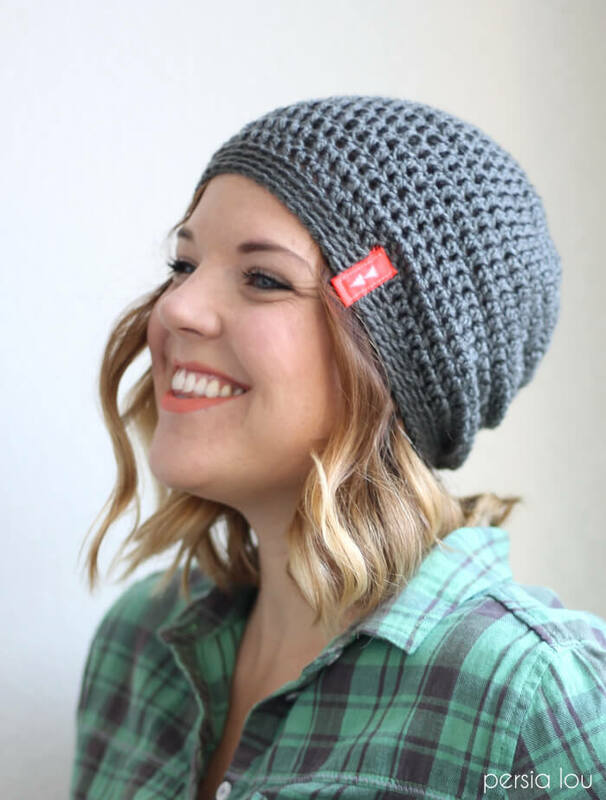 I was looking forward to cooler weather (which I am still looking forward to), and thinking about simple crocheted gift ideas. 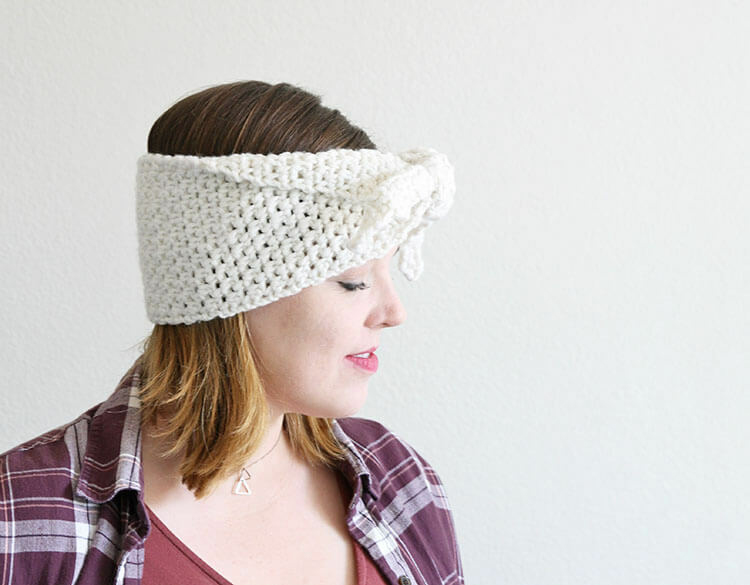 I’m all about handmade gifts that don’t take ages to make, and this crochet headband pattern makes a perfect gift for a girl with a unique, funky style. 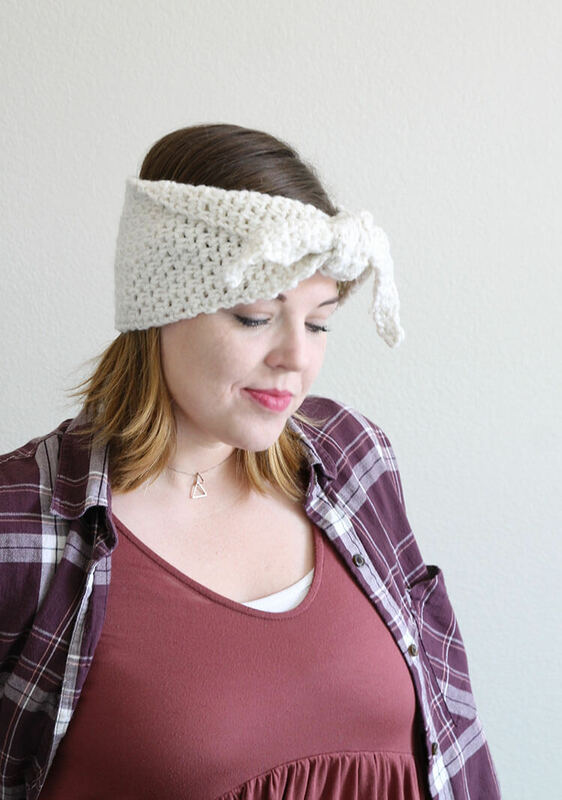 This free crochet headband pattern creates a wide and thick headband that ties in the front for a cute bandana style. I love it! I used the moss stitch to create this pattern, which is one of my favorite simple crochet stitch patterns. 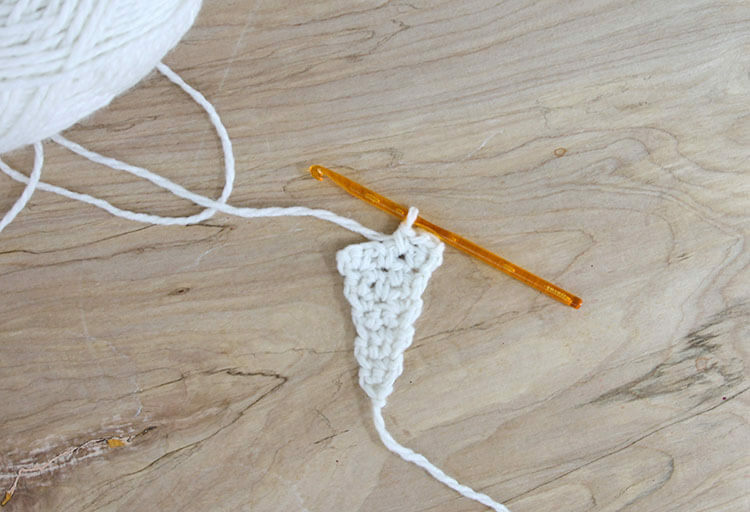 To create the moss stitch, you alternate chain stitches and single crochet stitches, working your single crochet stitches into the chain stitches of the previous row. 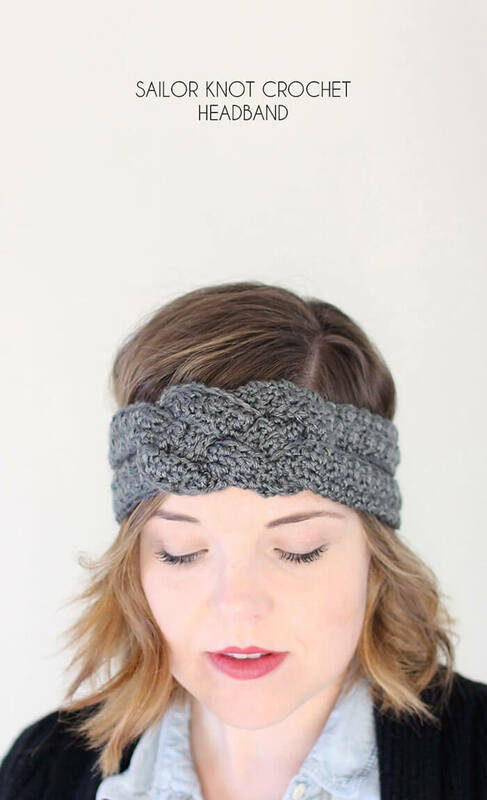 It gives the headband a nice texture without adding bulk to the fabric. 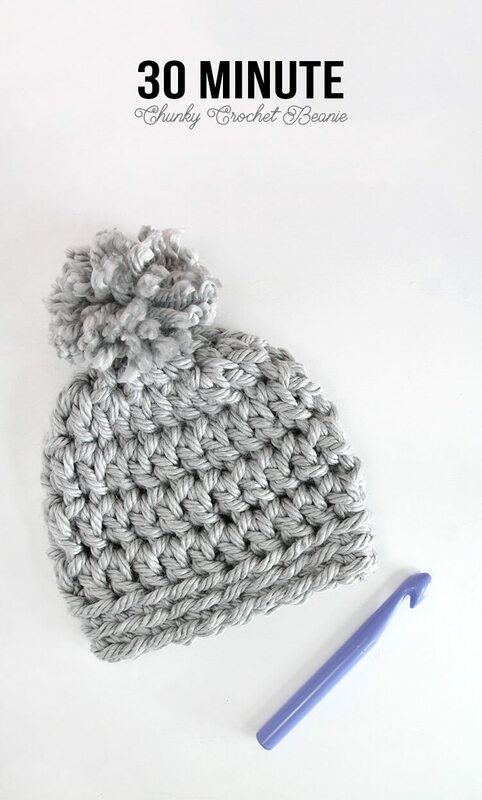 Okay, ready to crochet? Here we go! 1 Ball Bulky #5 Yarn – I used Darice Folklore. Wool Ease Chunky or Paton’s Classic Wool Bulky should work well too. Row 1: Ch 2, sc in second ch from hook (1 sc). Turn. Row 2: Ch 1, 2 sc in same st (2 sc). Turn. Row 3: Ch 1, sc in each of the next 2 sts (2 sc). Turn. Row 4: Ch 1, sc in same st, ch 1, sc in next st (2 sc, 1 ch sp). Turn. Row 5: Ch 1, sc in same st, sc in ch 1 sp, sc in last st (3 sc). Turn. Row 6: Ch 1, sc in each st across (3 sc). Turn. Row 7: Ch1, 2 sc in same st, ch 1, skip next st, 2 sc in last st (4 sc, 1 ch 1 sp). Turn. Row 8: Ch 1, sc in same st, *ch 1, skip next st, sc, repeat from * once (3 sc, 2 ch 1 sps). Turn. Row 9: Ch 1, sc in same st, sc in ch 1 sp, ch 1, skip next st, sc in next 2 sts (4 sc, ch 1 sp). Turn. Row 11: Ch 1, 2 scs in same st, ch 1, skip next st, sc, ch 1 skip next st, 2 sc in last st (5 scs, 2 ch 1 sps). Turn. Row 12: Ch 1, sc in same st, *ch 1, skip next st, sc, repeat from * twice (4 scs, 3 ch 1 sps). Turn. Row 13: Ch 1, sc in same sts, sc in ch 1 sp, *ch 1, skip next st, sc in ch 1 sp, repeat from * once, sc in last st (5 scs, 2 ch 1 sps). Turn. Row 15: Ch 1, 2 sc in same st, *ch 1, skip next st, sc in ch 1 sp, repeat from * once, ch 1, skip next st, 2 sc in last st (6 scs, 3 ch 1 sps). Turn. Row 16: Ch 1, sc in same st, *ch 1, skip next st, sc in ch 1 sp, repeat from * three times (5 scs, 4 ch 1 sps). Turn. Row 17: Ch 1, sc in same st, sc in ch 1 sp, *ch 1, skip next st, sc in ch 1 sp, repeat from * twice, sc in last st (6 scs, 3 ch 1 sps). Turn. Row 19: Ch 1, 2 sc in same st, *ch 1, skip next st, sc in ch 1 sp, repeat from * twice, ch 1, skip next st, 2 sc in last st (7 scs, 4 ch 1 sps). Turn. Row 20: Ch 1, sc in same st,*ch 1, skip next st, sc in ch 1 sp, repeat from * four times (6 scs, 5 ch 1 sps). Turn. Row 21: Ch 1, sc in same st, sc in ch 1 sp, *ch 1, skip next st, sc in ch 1 sp, repeat from * three times, sc in last st (7 scs, 4 ch 1 sps). Turn. Row 23: Ch 1, 2 sc in same st, *ch 1, skip next st, sc in ch 1 sp, repeat from * three times, ch 1, skip next st, 2 sc in last st (8 scs, 5 ch 1 sps). Turn. Row 24: Ch 1, sc in same st,*ch 1, skip next st, sc in ch 1 sp, repeat from * five times (7 scs, 6 ch 1 sps). Turn. Row 25: Ch 1, sc in same st, sc in ch 1 sp, *ch 1, skip next st, sc in ch 1 sp, repeat from * four times, sc in last st (8 scs, 5 ch 1 sps). Turn. Row 27: Ch 1, 2 sc in same st, *ch 1, skip next st, sc in ch 1 sp, repeat from * four times, ch 1, skip next st, 2 sc in last st (9 scs, 6 ch 1 sps). Turn. Row 28: Ch 1, sc in same st,*ch 1, skip next st, sc in ch 1 sp, repeat from * six times (8 scs, 7 ch 1 sps). Turn. Row 29: Ch 1, sc in same st, sc in ch 1 sp, *ch 1, skip next st, sc in ch 1 sp, repeat from * five times, sc in last st (9 scs, 6 ch 1 sps). Turn. Row 31: Ch 1, 2 sc in same st, *ch 1, skip next st, sc in ch 1 sp, repeat from * five times, ch 1, skip next st, 2 sc in last st (10 scs, 7 ch 1 sps). Turn. Row 32: Ch 1, sc in same st,*ch 1, skip next st, sc in ch 1 sp, repeat from * seven times (9 scs, 8 ch 1 sps). Turn. Row 33: Ch 1, sc in same st, sc in ch 1 sp, *ch 1, skip next st, sc in ch 1 sp, repeat from * six times, sc in last st (10 scs, 7 ch 1 sps). Turn. Row 35: Ch 1, 2 sc in same st, *ch 1, skip next st, sc in ch 1 sp, repeat from * six times, ch 1, skip next st, 2 sc in last st (11 scs, 8 ch 1 sps). Turn. Row 36: Ch 1, sc in same st,*ch 1, skip next st, sc in ch 1 sp, repeat from * eight times (10 scs, 9 ch 1 sps). Turn. Row 37: Ch 1, sc in same st, sc in ch 1 sp, *ch 1, skip next st, sc in ch 1 sp, repeat from * seven times, sc in last st (11 scs, 8 ch 1 sps). Turn. Row 39: Ch 1, 2 sc in same st, *ch 1, skip next st, sc in ch 1 sp, repeat from * seven times, ch 1, skip next st, 2 sc in last st (12 scs, 9 ch 1 sps). Turn. Row 40: Ch 1, sc in same st,*ch 1, skip next st, sc in ch 1 sp, repeat from * nine times (11 scs, 10 ch 1 sps). Turn. Row 41: Ch 1, sc in same st, sc in ch 1 sp, *ch 1, skip next st, sc in ch 1 sp, repeat from * eight times, sc in last st (12 scs, 9 ch 1 sps). Turn. Row 43: Ch 1, 2 sc in same st, *ch 1, skip next st, sc in ch 1 sp, repeat from * eight times, ch 1, skip next st, 2 sc in last st (13 scs, 10 ch 1 sps). Turn. Row 44: Ch 1, sc in same st,*ch 1, skip next st, sc in ch 1 sp, repeat from * ten times (12 scs, 11 ch 1 sps). Turn. Row 45: Ch 1, sc in same st, sc in ch 1 sp, *ch 1, skip next st, sc in ch 1 sp, repeat from * nine times, sc in last st (13 scs, 10 ch 1 sps). Turn. Rows 46-61 : Repeat Rows 44 & 45 ending with a Row 45 repeat (to adjust the length of the headband, crochet more or fewer rows in this section). Row 62: Ch 1, sc2tog, sc in ch 1 sp, *ch 1, skip next st, sc in ch 1 sp, repeat from *eight times, sc2tog (12 scs, 9 ch 1 sps). Turn. Row 63: Ch 1, sc in same st, *ch 1, skip next st, sc in ch 1 sp, repeat from * nine times (11 scs, 10 ch 1 sps). Turn. Row 64: Ch 1, sc in same st, sc in ch 1 sp, *ch 1, skip next st, sc in ch 1 sp, repeat from * eight times, sc in last st (12 scs, 9 ch 1 sps). Turn. Row 66: Ch 1, sc2tog (sc first st and first ch 1 sp together), *ch 1, skip next st, sc in ch 1 sp, repeat from *seven times, ch 1, skip next st, sc2tog (10 scs, 9 ch 1 sps). Turn. Row 67: Ch 1, sc in same st, sc in next st, *ch 1, skip next st, sc in ch 1 sp, repeat from * seven times, sc in last st (11 scs, 8 ch 1 sps). Turn. Row 68: Ch 1, *ch 1, skip next st, sc in ch 1 sp, repeat from * eight times, (10 scs, 9 ch 1 sps). Turn. Row 71: Ch 1, sc in same st, *ch 1, skip next st, sc in ch 1 sp, repeat from * seven times (9 scs, 8 ch 1 sps). Turn. Row 72: Ch 1, sc in same st, sc in ch 1 sp, *ch 1, skip next st, sc in ch 1 sp, repeat from * six times, sc in last st (10 scs, 7 ch 1 sps). Turn. Row 74: Ch 1, sc2tog (sc first st and first ch 1 sp together), *ch 1, skip next st, sc in ch 1 sp, repeat from *five times, ch 1, skip next st, sc2tog (8 scs, 7 ch 1 sps). Turn. Row 75: Ch 1, sc in same st, sc in ch 1 sp, *ch 1, skip next st, sc in ch 1 sp, repeat from * five times (9 scs, 6 ch 1 sps). Turn. Row 76: Ch 1, sc in same st, *ch 1, skip next st, sc in ch 1 sp, repeat from * six times (8 scs, 7 ch 1 sps). Turn. Row 79: Ch 1, sc in same st, *ch 1, skip next st, sc in ch 1 sp, repeat from * five times (7 scs, 6 ch 1 sps). Turn. Row 80: Ch 1, sc in same st, sc in ch 1 sp, *ch 1, skip next st, sc in ch 1 sp, repeat from * four times, sc in last st (8 scs, 5 ch 1 sps). Turn. Row 83: Ch 1, sc in same st, sc in ch 1 sp, *ch 1, skip next st, sc in ch 1 sp, repeat from * three times, sc in last st (7 scs, 4 ch 1 sps). Turn. Row 84: Ch 1, sc in same st, *ch 1, skip next st, sc in ch 1 sp, repeat from * four times (6 scs, 5 ch 1 sps). Turn. Row 87: Ch 1, sc in same st, *ch 1, skip next st, sc in ch 1 sp, repeat from * three times (5 scs, 4 ch 1 sps). Turn. Row 88: Ch 1, sc in same st, sc in ch 1 sp, *ch 1, skip next st, sc in ch 1 sp, repeat from * twice, sc in last st (6 scs, 3 ch 1 sps). Turn. Row 91: Ch 1, sc in same st, sc in ch 1 sp, ch 1, skip next st, sc in ch 1 sp, ch 1, skip next st, sc in ch 1 sp, sc in last st (5 scs, 2 ch 1 sps). Turn. Row 92: Ch 1, sc in same st, *ch 1, skip next st, sc in ch 1 sp, repeat from * twice (4 scs, 3 ch 1 sps). Turn. Row 94: Ch 1, sc2tog, sc in ch 1 sp, ch 1, skip next st, sc in ch 1 sp, sc2tog (4 scs, ch 1 sp). Turn. Row 95: Ch 1, *ch 1, skip next st, sc in ch 1 sp, repeat from * once (3 scs, 2 ch 1 sps). Turn. Row 96: Ch 1, sc in same st, sc in ch 1 sp, ch 1, skip next st, sc in ch 1 sp, sc in last st (4 scs, ch 1 sp). Turn. Row 98: Ch 1, sc2tog, ch 1, skip next st, sc2tog (2 sc, ch 1 sp). Turn. Row 99: Ch 1, sc in same st, sc in ch 1 sp, sc in last st (3 scs). Turn. Row 100: Ch 1, sc in same st, ch 1, skip next st, sc in last st (3 scs). Turn. Row 101: Ch 1, sc2tog, sc in last st (2 scs). Turn. Row 102: Ch 1, sc in each st (2 scs). Turn. Row 103: Ch 1, sc2tog (1 sc). Finish off. Weave in ends. 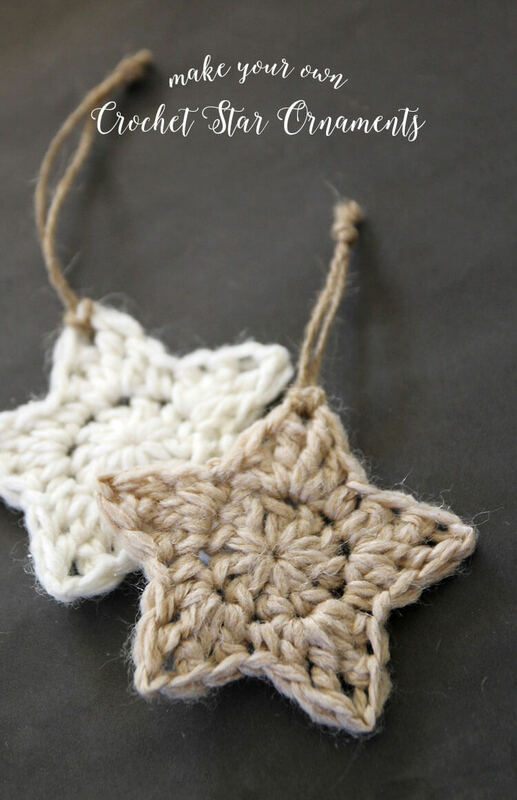 When you are finished, you will have a long piece of crocheted fabric with points on both ends – like a little scarf. To wear the headband, simply wrap it around your head and tie with a double knot in the front. And that’s it! 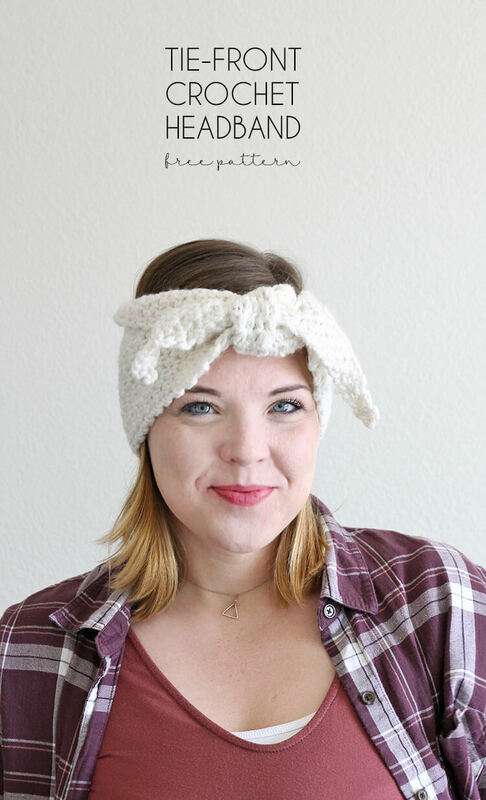 If you like this little tie-front crochet headband pattern and make your own, I would absolutely love to see it! Share your photos to my facebook page or tag me on instagram or twitter (@persialou), and don’t forget to use the hashtag #persialou for a chance to be featured.